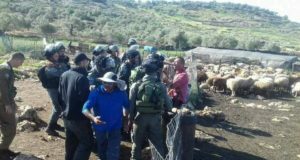 Residents of the Salfit District join with international and Israeli peace activists to hold a week of non-violent resistance actions from Saturday, July 16 through Thursday, July 21. These actions are organized by the Popular Committee Against the Wall and supported by the International Solidarity Movement and International Womens Peace Service. 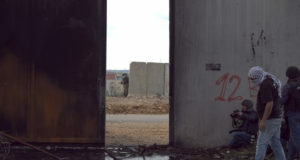 Activists will march along the route of the Apartheid Wall to see first-hand the ongoing construction of the Wall and meet with residents who have been severely impacted by the confiscation of land for the Wall. They will also learn about the growing non-violent movement in the region, which has held more than 50 non-violent protests against the Wall during the last year. The section of the Wall around the illegal Ariel settlement is located approximately 20 km inside the Green Line. 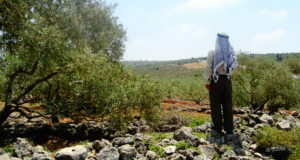 It’s slated to confiscate approximately 6,243 acres (24,972 dunums) from the villages of Hares, Kifl Hares, Marda, Iskaka and Salfit Many other villages in the Salfit district, including Mas-ha, Az-Zawiya, Rafat, and Deir Ballut have also lost land due to the construction of the Wall. Wed, July 20 Meeting with the village council, participants in the summer camp, and Women for Life in Az Zawiya, 10-2 p.m.
Thurs, July 21 Deir Ballut, march to nearly completed school where construction has been frozen by the Israeli army; visits to Kafr ad Dik and Bruqin.